ASUS has released a new UEFI BIOS version for its ROG Maximus XI Hero motherboard that enables support of up to 128 GB of DDR4 memory platform using 32 GB unbuffered modules featuring Samsung's newest 16 Gb memory chips. The company will release new BIOSes for other Intel Z390-based platforms shortly. Other motherboard manufacturers will likely follow as Intel has stated that this memory will be supported by its 9th Gen Core processors. Last year Samsung started to mass produce 16 Gb DDR4 memory chips primarily aiming high-capacity RDIMMs for servers. These chips eventually came down to consumer grade memory as well, allowing for 32 GB UDIMMs to be added to Samsung's portfolio. Because Intel’s MRC for mainstream processors doesn't automatically support 16 Gb ICs, new firmware is required. 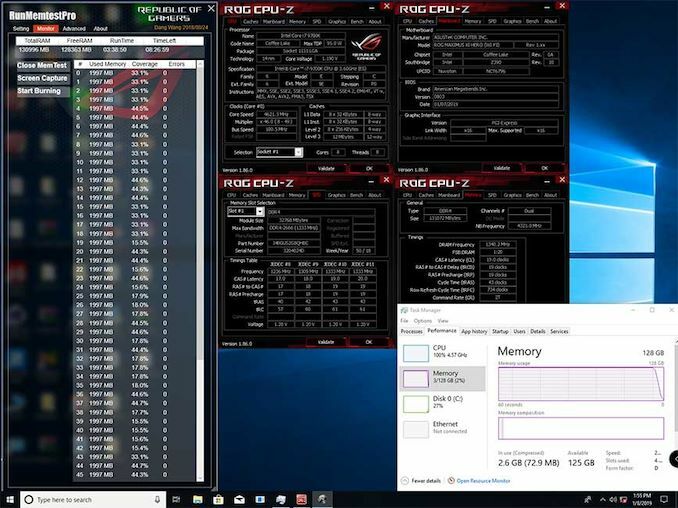 The company has officially updated its memory reference code for the 9th Gen Core processors, and so it is up to motherboard manufacturers to update their UEFI BIOSes to gain support for 32 GB UDIMMs. To date, ASUS has validated only SL Link's J4BGUS2G8QHBC DDR4-2667 CL19 modules with its ROG Maximus XI Hero motherboard. Intel is also validating various modules that use 16 Gb chips with its processors, so expect its “official” list of supported 32 GB UDIMMs to emerge in the coming weeks or months. It is worth pointing out that there are two competing implementations for 32GB UDIMMs. 'Double Capacity' memory modules released by G.Skill and Zadak last year are based on 32x8 Gb chips, but are essentially two modules on one PCB. This is different to the Samsung modules, which use 16x16 Gb chips.
" 'Double Capacity' memory modules released by G.Skill and Zadak last year are based on 32x16 Gb chips, but are essentially two modules on one PCB. This is different to the Samsung modules, which use 16x32 Gb chips."